A high tunnel located at the University of Minnesota North Central Research and Outreach Center in Grand Rapids, Minnesota, was used to test the effects of super-oxygenated water on a crop of tomatoes. The tomatoes used in the trial were a determinate grafted variety. The rootstock was “Maxifort”, which is known for its disease resistance and improved plant vigor. The scion was BHN 589, a variety well-suited for hot conditions and known to produce high yields of large fruit with no cracks. The tunnel, which was oriented north to south, was divided into two blocks (block 1 on the west side and block 2 on the east side) to control for differences in light intensity. Ten plots of raised beds were created in each block. Two lines of drip irrigation tape were installed in the beds at a depth of 4″. Four tomato plants per plot were planted in the tunnel. Half the plots were randomly assigned to receive the super-oxygenated water, and the remaining half received untreated water. Super-oxygenated water was created using an Oxygen Research Group LLC, Minneapolis, Minnesota, “Water Dog” machine. This machine uses an electrolysis procedure to separate water into hydrogen and oxygen. The hydrogen is released, thereby increasing the percentage of oxygen in the water. (2.5 ppm oxygen in untreated water vs. 12 ppm in treated water) A weak 20-10-20 fertilizer solution was incorporated into the drip irrigation water. Tensiometers were used to monitor the soil moisture. When soil conditions indicated, tunnels were supplied with approximately 50 gallons of water in a one hour period. Plants were watered daily in hot weather, decreasing to several times per week in September as temperatures cooled, and then further decreasing to weekly watering in late September and October, based on tensiometer readings. Tomato plants were planted in the tunnels in mid-June. Small fruit were culled from the tomatoes on June 20th and 27th to allow for better plant development. Tomato plants were supported with a Florida weave trellising system, with tiers added as the plants grew. Care was taken to remove any growth on the tomatoes that may have sprouted from the rootstock. Harvest began on August 16th and was terminated on October 14th. Fruit was classified as good, or marketable, if it was in perfect condition, or as imperfect, if it was blemished for any reason including cracks, soft spots or insect damage. Some supplemental heat was supplied to the tunnel with a portable propane heater on several nights when temperatures dipped near or below freezing during October. Green fruit was harvested at the termination of the study in order to estimate the total yield for the season. 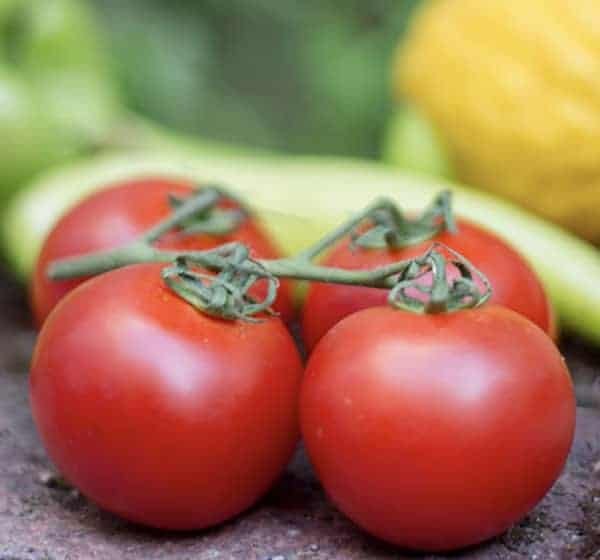 Tomatoes plants supplied with super-oxygenated water showed a positive gain in yield over plants receiving untreated water, while fruit size was not affected by the treatment. 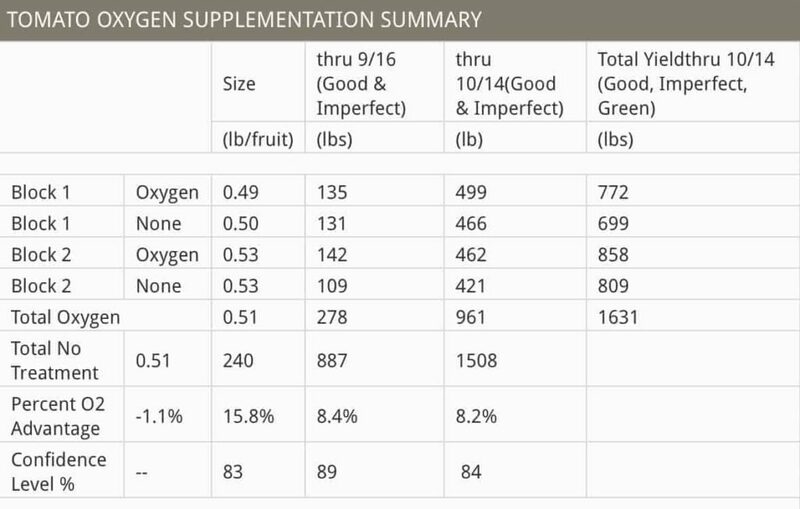 Since separating good from imperfect fruit required some judgment to be made regarding the degree to which the fruit was unusable (cracking, insect damage, etc), the yields of both good fruit and fruit labeled as imperfect for any reason were combined together for analysis. Fruit from both treatments was of good quality, with only 5% to 6% cracked or spoiled fruit. Total yields (including good and imperfect fruit) as of the 9/16 harvest were evaluated, since growth was slowing after that time due to cooler temperatures and shorter day-length. These conditions led to much decreased water usage. The yield gain from first harvest to mid-September was 15.8% (83% confidence level). Since weather conditions remained mild, harvest continued into mid-October. The total yield percentage increase from treated plants at that time was 8.4% (89% confidence level) or 8.2% for all fruit including good, imperfect and green fruit (84% confidence level). See table 1. Cumulative total pounds of fruit during the harvest period through mid-September are shown in figure 1, and those through mid-October are shown in figure 2. Cumulative yields from plants provided with super-oxygenated water were greater than those from plants provided with untreated water throughout the study period. The differences between treated yields and untreated yields peaked in mid-September. The graph in figure 2 shows some slowing of the percentage difference after mid-September, as growth slowed and watering decreased. Tomato crops showed an increase in yield when plants were treated with super-oxygenated water, while fruit size was unaffected. 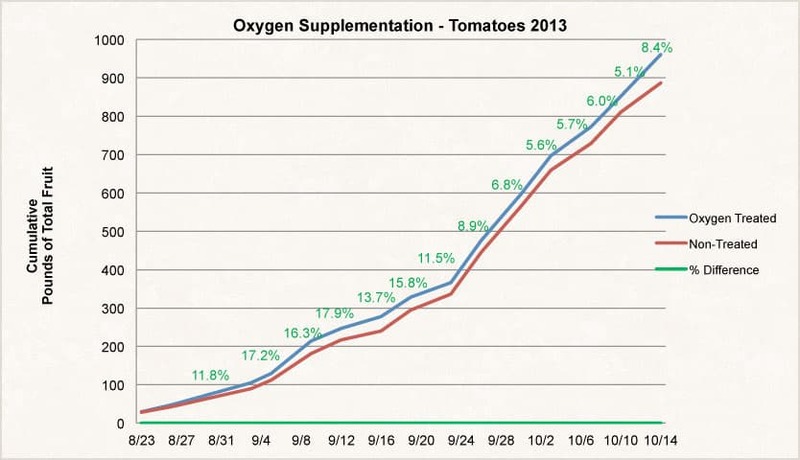 Cumulative yields were positive for super-oxygenated treated plants throughout the growing season, although individual harvests varied. 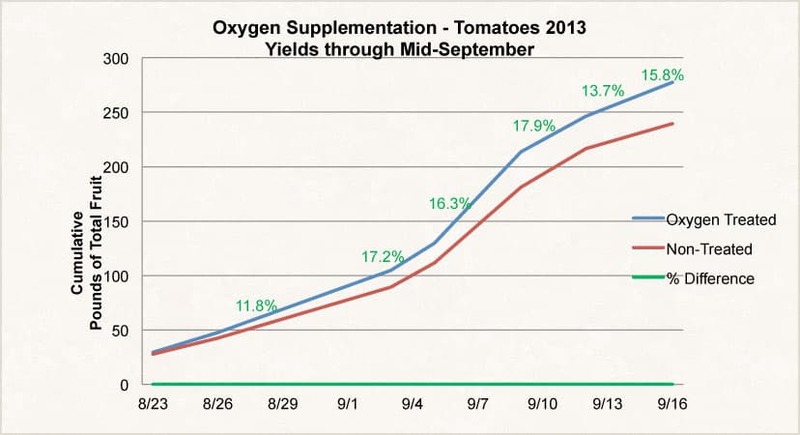 The difference in total yields was most positive for treated plots thru mid-September, reaching nearly 16%. Since day-length and heat were decreasing after mid-September, plant growth and yield declined as did the differences between the treated and untreated plots. The difference between treated and untreated plots narrowed as growth slowed as expected since less water was being applied to the plants. Irrigation amounts dropped from nearly 50 gallons per day several times per week to less than 25 gallons one time per week as temperatures cooled. Total yield through mid-October, including all good, imperfect, and green fruit, showed a significant advantage for treated plots (8.2% with 84% confidence level). This yield advantage was maintained even though differences were narrowing between treated and untreated plots as growth slowed and much less water was supplied to the plants in the later part of September and in October. One caveat for this study is that the plants were installed in the high tunnels somewhat late in the season, due to the cold spring growing conditions in zone 3b. 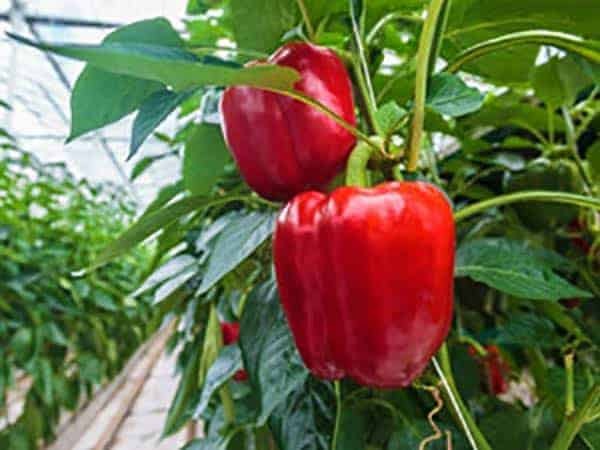 One advantage of growing crops in high-tunnels is the ability to extend the growing season both in the spring and in the fall. These plants were not available for planting until mid-June, while tunnel temperatures may have permitted planting in May if supplemental heating was available. There was a substantial amount of green tomato fruit remaining when harvesting was terminated on October 14th, and adding the immature fruit yield to the total yield can provide an estimate of what may have been achieved if the growing season had been started earlier. The amount of immature fruit was substantial, at nearly 1300 pounds, and increased the differential advantage for treated plots from 74 pounds to 123 pounds at the end of the study. Supplementation with super-oxygenated water is a very promising concept and deserves further consideration for high tunnel application. High tunnels are an ideal environment for such experiments, since water can be precisely controlled and rainfall is not an issue. Positive increases in yields were observed for tomatoes, and earlier planting to take advantage of the additional heat in the tunnel environment possibly may have resulted in even greater yield differentials.